Funny and thoughtful but not sharp enough, Jason Reitman's satire about Gary Hart's tabloid downfall aims for controlled chaos but settles for conventional finger-wagging. We've been treated to a spate of hard-hitting Hollywood dramas like Spotlight ( Tom McCarthy, 2015) and The Post (Steven Spielberg, 2017) that rightly valorized battles waged by the press to protect truth, justice, and the America way. It's a strange phenomenon, given how frequently journalists are pilloried in the culture, the frequency with which they're turned into cinematic heroes. Since all pendulums must swing, here comes The Front Runner, a movie that wants to turn the blame back on the Fourth Estate for the perilous state democracy finds itself in. In general, it's a fair cop. For every ink-stained wretch poring through documents to file a hard-hitting expose of corruption and cover-ups, it can seem like there are ten herd-followers running with the pack to file some copy, any copy, on whatever the scandal du jour might be. But while there's plenty of blame to go around when it comes to the misdeeds of the press, reporting on Gary Hart's infidelity is certainly not the most heinous. 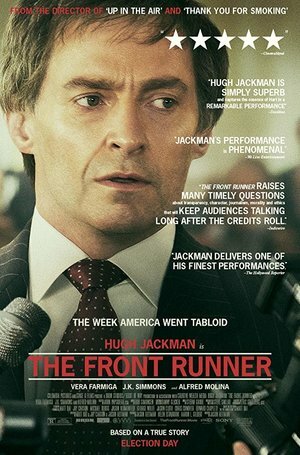 Based on Matt Bai's 2014 book All the Truth is Out: The Week Politics Went Tabloid, The Front Runner starts off as a zippy election comedy about the undoing of Senator Gary Hart's presidential ambitions, but collapses under the weight of its serious intent. When we first see Hart (Hugh Jackman), he's lost the bid for the 1984 Democratic nomination. Director Jason Reitman shoots that opening scene and many others as if he's been watching a lot of Nashville, tracking the casual chatters between reporters and campaign staffers as they wend through a crush of news vans and onlookers trying to get a glimpse of history. Four years later, Hart is setting himself up to lead the Democratic party out of their eight years of Reagan era irrelevance. Only, there's that whole problem of all the time he spent with that blonde, Donna Rice (a slightly dazed-seeming Sara Paxton) who was definitely not his wife, Lee (Vera Farmiga, staunch as ever). In the world of the movie, Hart is the unquestioning favorite for the nation's and our support. Embodied by Jackman with a sharp, quick-witted impatience, he's the policy wonk with movie-star looks and snappy patter of every campaign manager's dreams. We're repeatedly assured that he's the ideas guy who will finally hone the Democratic party message with serious intent and populist appeal. Meet the Press policy breakdown. But a scene or two of ideological contrast with Hart and his presumptive rival, George H.W. Bush, would have given some weight to the drama about tabloid journalism. Because Hart is such a McCain-esque straight-talking charmer, he's given leagues of deference by the press pool. Even though the true tabloid media era is just then powering up—a pointed shot of a TV set showing a tearful Tammy Faye Baker provides all the foreshadowing we need—most of the reporters are still acting as though personal indiscretions are none of their business to write about. The debate over whether they should be writing about them, and if "the public" has a true interest, is the question running through the movie. It takes a definite stand, showing a Washington Post meeting about the Hart-Rice affair devolving from journalistic ethics to worry over getting scooped by the Miami Herald, whose comically inept stakeout of Hart's home still manages to catch him out. Meanwhile, reporter AJ Parker (Mamoudou Athie) is the movie's stricken conscience, twisting himself up over whether to help break the unspoken code about what's off-limits. No, not much of that is illuminating, or even entertaining. Early on is the fun part. This is where we get to see the campaign as the scrappy, smart insurgents about to take their long-awaited prize. 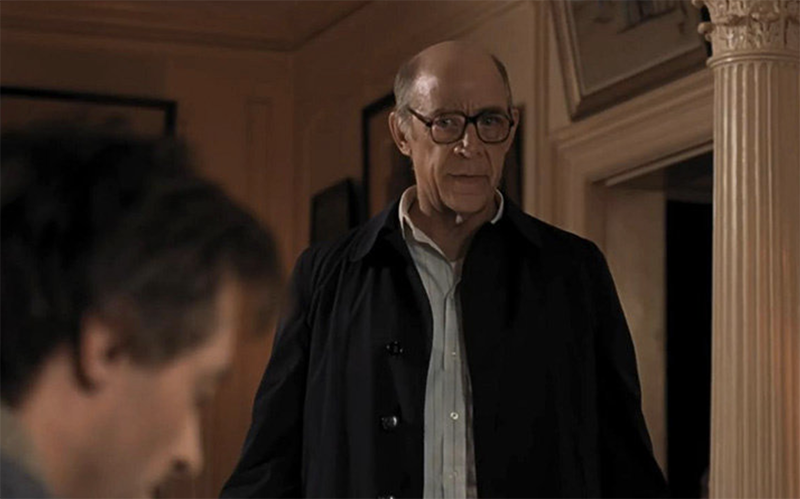 Reitman has a good feel for the chaos of the crowded room, with snatches of conversation plucked out from the noise and J.K. Simmons, playing Hart's cynical yet still somehow disappointed campaign manager, as usual cutting through the hugger-mugger with the clean whisk of a scalpel. Reitman never manages anywhere close to the dense layering of an Altman ensemble, but much of the noise and tumult of a campaign is speedily and entertainingly captured. But this is ultimately a narrative about an idealistic campaign thwarted by the grotty realities of media and invasions of privacy at the dawn of the modern tabloid era. By the end, we're supposed to shake our heads at the sunken depths to which the media has dragged the body politic. In a climactic press conference, Parker asks Hart the damning question, and the candidate's flailing answer sends his campaign down in flames. Of course, since we haven't seen enough of how Hart would turn around the policies of the Reagan era, it's hard to view this as the catastrophe the movie intends us to. 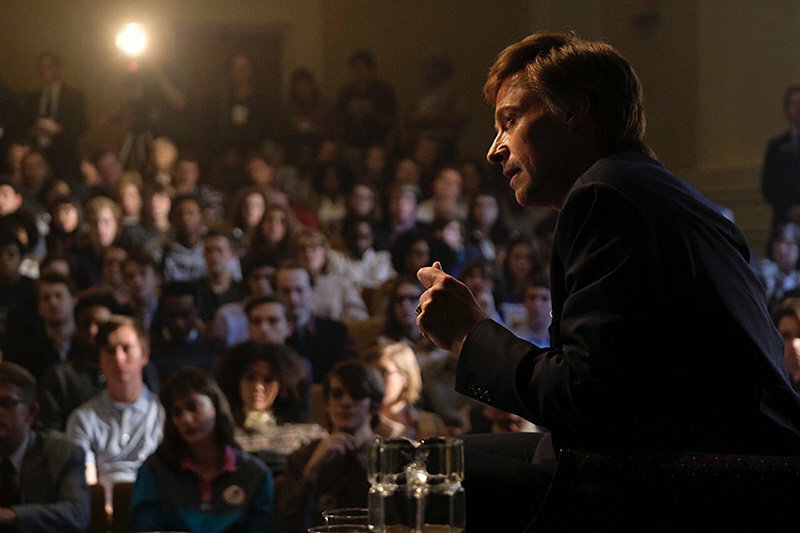 For all its charms, The Front Runner fails to make the case that journalists should somehow be forbidden from asking personal questions of candidates. The era of reporters deferring to the pieties of the political class ended, and rightfully so, with the Pentagon Papers and Watergate. Any movie featuring the Washington Post as a starring character should know that. Enjoy Bernard Boo's interview with Jason Reitman, Matt Bai, and Jay Carson on The Front Runner.